First off, let me apologize that the blogging has been so sporadic as of late. I always need some serious downtime after a big race and Kona was sort of the culmination of about 6 years of Ironman racing, so some time away from training has probably been good for me in the long run. In the meantime, I have put tons of time and energy into our new coaching company: Revolution Multisport. Coaching is going well, but it will definitely cut into training time. Providing true custom coaching takes way more attention than just modifying a pre-set plan to fit an athlete. Good news is that we are already nearing capacity for this season. In May I will be attending the 3-day USAT Level I coaching certification which should be interesting. Since Kona I don't know how many times I have been asked, "So, what's next?" I am 100% convinced that living your life focused on each day's journey is the best way to give one the proper gratitude for this crazy ride. Still that doesn't mean that there aren't really nice "scenic overlooks" along the way! Kona was definitely one of these. I spent so much time and effort (and $) getting to Kona that "What Happens Next" only rarely crossed my mind. Two weekends ago, I headed down near Springfield, IL for the Tour de Groundhog, which is a late-season cross race. I raced here last year and both years have been an absolute mud fest. My bike weighed twice as much at the finish as it did when I started, but somewhere amidst the suffering that cross is all about, I was definitely having fun! So what's next is embracing my dirty nature (you can read that however you would like!) I started mountain biking about the same time I started tris (early '90s) and I have always liked it better. Problem is my geographic location is much better suited to road riding. Nevertheless, in 2009 I will be making a serious foray into the world of Xterra and to a lesser extent mountain bike racing. I've already done 4 off-road tris in the past and had some success, so I am not brand-new to the dirty side of triathlon. To embrace the "No day, but today" philosophy, I am going to try and take Xterra racing to the same high levels that I did with regular triathlon. That means aiming for either Xterra nationals or even the World Championships in '09. The midwest qualifier for Worlds is in Michigain in May. No that, is not a typo. 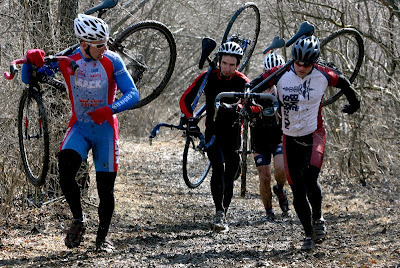 An off-road triathlon in Michigan in May. As a general rule of thumb you don't even want to get in most of the Illinois lakes in May! This is part of what draws me to Xterra- they generally do everything possible to make the courses difficult. At this point in my career, given the proper training, I know I can finish any Ironman in around 10 hours. With Xterra though, finishing is never guaranteed. Crashes and mechanical problems routinely cause the best Xterra pros to have a DNF next to their names. I have a rough season schedule up on the right hand side of my blog. I sent it to my wife first with the important disclaimer that this is everything I'd like to race. I'm afraid many of these will be on the cutting block when it comes down to it. In any case this season represents a big move towards Xterra and sharpening the mountain biking skills. Well, last year was the trial run for this camp. During my college xc days we always did a week-long pre-season camp and I sort of modeled this camp off that awesome experience. Feedback from last year's participants was overwhelmingly positive, so we have decided to bring it back again. This year's camp is a little later (May 1-3) but still great timing for a pre-season camp. The camp is 2.5 days of workouts and seminars geared towards beginner and intermediate triathletes. Through a variety of cost-cutting measures we are able to offer this camp at about 1/2 the cost of other camps. Camp, all meals and lodging for $250. We don't make a killing on this, but we did have fun meeting new triathletes last year! Camp is capped at 20 people and we anticipate it filling up.